The Noakes Foundation and Banting Blvd. have joined forces and are proud new affiliates of a programme that, amongst other products, will include an affordable LCHF substitute to maize pap and bread. “We are particularly proud of HEBA Pap, a brand and concept that we have co-developed off the back of our community work. We knew the country needed a staple substitute to aid getting off sugar as so many South Africans rely on pap as the main part of their diets.” says The Noakes Foundation’s Jayne Bullen. Banting Blvd. and the new LCHF pap will be involved in the roll out of Eat Better South Africa!, a community programme where men and women are trained on a budget banting eating plan with the goal of promoting a healthy Banting lifestyle in low-income areas. The sells for only R29 a packet and can be used to make bread, bread in a mug, krummelpap and porridge. HEBA Pap is good source of protein, high in dietary fibre, low in sodium, grain and gluten free with no added sugar, this means eating less and staying fuller for longer. It contains a mix of ground seeds and coconut flour and is much lower in carbohydrates when compared to common staple foods. Subject to a very stringent vetting and product analysis, The Noakes Foundation is working alongside Banting Blvd. to spread the LCHF word and take it to the rest of the country and the world. Banting Blvd. is pioneering a distribution model that allows for Banting ambassadors to sell HEBA directly to their communities at lower prices with the vision of creating Banting spaza shops. The Foundation will flagship and train people through the Eat Better South Africa! programmes, starting with community members from Ocean View, Delft, Lavender Hill and Villiersdorp. The product launch also forms part of the start of a new affilation between The Noakes Foundation and Banting Blvd. All products in the range will hold The Noakes Foundation stamp. The stamp is offered to a select group of LCHF partners that the organisation work together within the community programmes and that they believe are making South Africa a better place in different ways. A portion of all Banting Blvd. products sold, all of which are green list ingredient based, will assist Eat Better South Africa! programmes through a small donation per product sold. 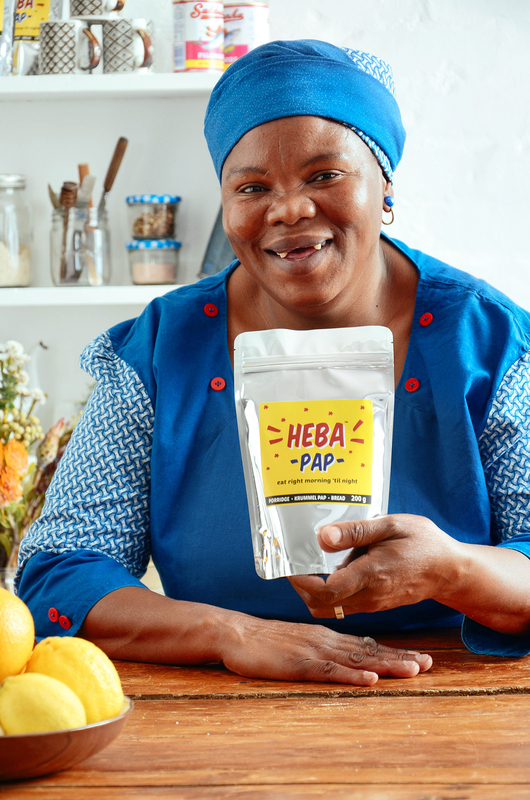 For every two bags of Heba Pap sold commercially, one will be given to the poor to help them eat and feed their families Better. What is Eat Better South Africa! ? Eat Better South Africa, is changing the lives of ordinary South Africans in the underprivileged areas of Cape Town and the surrounds. The intervention trains women and men between the ages of 35 – 65 on a budget Banting programme consisting of 3 meals for under R30 a day. Written by: Liesl Coetzer of Publicity. Email liesl@publicitysa.com or call 021 557 0213. Heba Pap recipes and product images available on request.